Create Your Own Super Bouncy Ball. These balls are approx 27mm sized balls. The Bouncy Ball you will create with this kit, is not of the same quality as the manufactured bouncy balls. 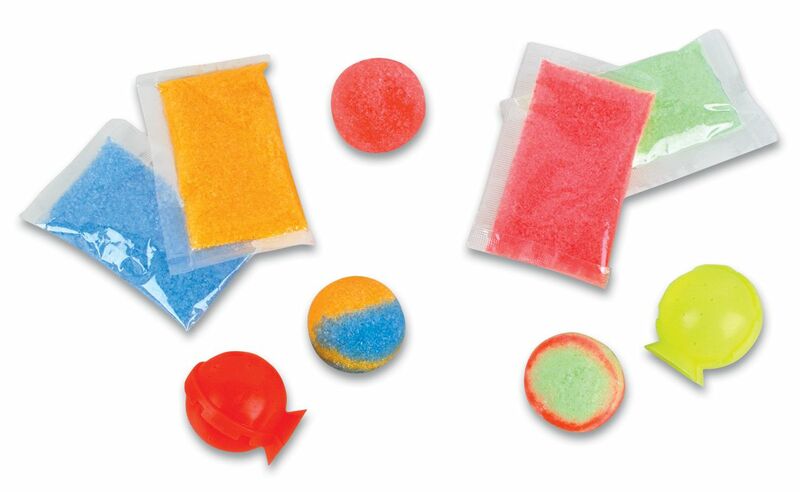 Price is for one Bouncy Ball Kit. There are 2 pouches of powder of different colors. Will make 2 balls total. Each bag of powder weighs approx. 10 grams. We offer 4Kg bags of Refill Powder too! There are 288 kits in one case. 2. Snip off the corner of the powder. 1 bag will make 1 bouncy ball. Use 1 bag for one color or use both to swirl or make each half different colors. 3. While Filling make sure you tap the mold on a solid surface to tightly pack the powder in. 4. After the Mold is Filled Carefully place it in a cup of COLD water. 5. Leave in the water for 2 minutes. Once out of the water Let it Sit for another 3 minutes. After 3 minutes Carefully pull apart the mold.